128 pp., 145 illustrations, photos. Index and bibliography. It had been U.S. Coast Guard Station No. 119, from which Guardsmen would conduct rescue and other operations in the waters at the southern end of Long Beach Island. Then it was decomissioned, abandoned, and a victim of fire, vandalism, and the elements on the edge of a remote salt marsh. Ultimately this relic of American coastal history was rescued by Rutgers University, and it has become an ideal scientific research facility. And today, instead of helping save mariners’ lives at sea, it is helping to save our marine and estuarine environment. Author Ken Able, the director of the field station, explores this past, the research, and the scientists who have worked here. He documents some of the earliest marine research, including some of the first scientific studies of New Jersey’s oysters  once a thriving, booming resource. Today the station is home to wide-ranging studies ? from measuring microscopic marine life (over a million samples have been carefully analyzed in the last quarter century) to deep-sea remotely-controlled submersibles. 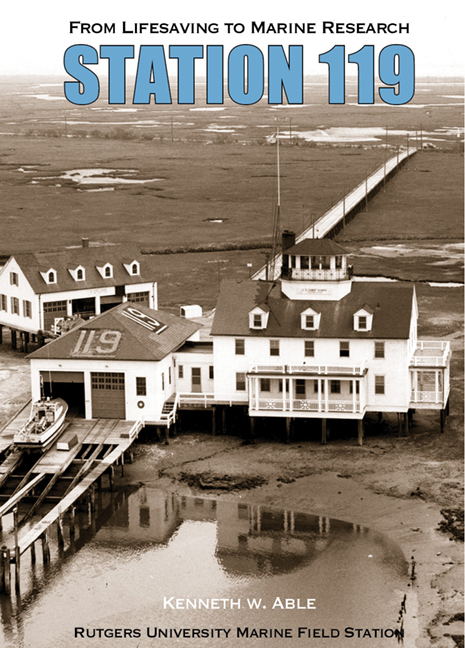 Maps, charts, scientific diagrams, historic photos of the station itself and of the early researchers at work in the creeks and bay add texture to the historical narrative. Ken Able is a Distinguished Professor in the Department of Marine and Coastal Sciences, and is Director of the Marine Field Station at Rutgers University. His diverse interests include estuarine ecosystems with a focus on life history and the ecology of fishes with an emphasis on habitat quality. The history, both natural and human, of field stations -- and their role in the progress of science  continues to intrigue the author.